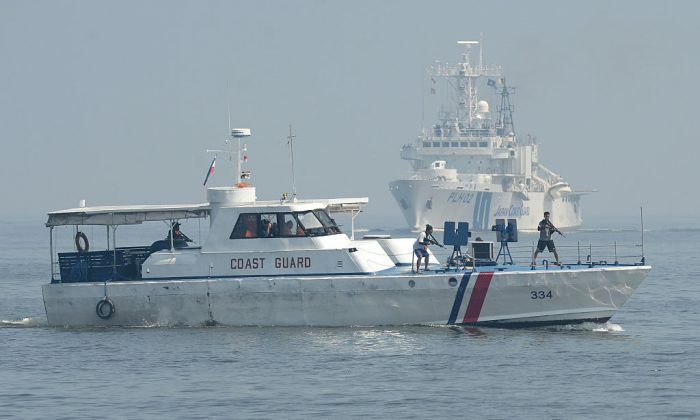 Philippine and Japanese coast guard personnel conduct joint anti-piracy exercises in the waters off Manila Bay on July 13, 2016. Except for a brief spike along East Africa that gained national attention with the capture of Captain Richard Phillips—and resulting Hollywood movie—pirates remain active in the South China Sea and around the world. The South China Sea averages about 150 piracy incidents per year but can see spikes of activity that push it up to 550. The exact numbers are hard to decipher because victims want to avoid time-consuming investigations, bad publicity, accusations of lax security, and higher insurance premiums. The area is such a prime target for many of the same reasons there are disputes over islands. Almost 30 percent of worldwide maritime traffic travels through the area. This includes all of the European goods to China, and almost all of the oil from the Persian Gulf to South East Asia. The port of Singapore and its nearby strait sees a ship every four minutes. There are many small islands, narrow channels, and places to hide. Pirates like Blackbeard, Mary Reed, and Steed Bonnet used similar geography off the outer banks of North Carolina to the same effect. Territorial disputes in the region often hamper enforcement and coordination. Finally, automation means that incredibly large tankers can have crews as little as 15 people, meaning that very small pirate crews can capture entire crews and gain lucrative prizes. There are some differences in piracy based on regions. Around Indonesia and Nigeria, for example, most of them occur near ports. Malaysia witnesses attacks more on the high seas. The former two have a lower standard of living, so attacks usually come from poor fishermen seeking a little boost of cash and staples. Their targets are usually small ships with scrap metal, or small tankers with liquid fuel, as both are easier to sell on the black market. Under the cover of night, they use ropes and grappling hooks to climb aboard with knives and machetes. If alerted in time, the crews fight back, often with crowbars in nasty hand-to-hand combat. Malaysia has more wealth, larger ships, and defensive measures, which requires more sophisticated methods launched by crime syndicates. The pirates usually get tipped off by unscrupulous crew members, port workers, or the government itself, and they already have a buyer prearranged. The pirates operate faster boats and their crews are armed with AK-47s and even some heavier weapons like rocket launchers. They quickly board at night, seize the ship, and set the crew adrift. Their cargoes are often in high demand. Because they get the fuel for free, they can quote really good prices to the refineries who don’t ask questions about the reason for the discount. Overall, piracy is thought to result in $6 billion in lost revenue due to higher insurance rates, disrupted logistics, and longer shipping times. The added speed needed to outrun the pirates, for example, burns more fuel and adds almost $100,000 in fuel costs per day to the journey. The ransoms for captured crew members or profits from black market sales become a vital part of economies that are often in shambles, and provide steady paychecks for youths that have few other options to support themselves and their families. There are countermeasures, such as stricter port security to prevent informants from tipping off pirates, as well as joint coast guard patrols. For instance, the Chinese have two ports in the Indian Ocean, near Pakistan and Djibouti. These are vital logistical hubs that can help their ships hunt down pirates. So their efforts are not simply sabre-rattling to scare the American public. It was a coalition of ships that vastly reduced piracy along Somali’s craggy coastline. That being said, China often militarizes its coast guard, and given the multiplicity of territorial disputes, military missions would likely do more harm than good. The best line of defense is a crew that is properly trained in defending against pirate attacks. Companies have hired additional armed guards, which help decrease the threat. But with such small crews, large ships, and tight profit margins that limit additional arms and security measures, they often get fewer guards than the situation demands. Despite these measures, we are likely to see more attacks in the future as shipping remains important, but economic factors drive the desperate to the water. This article first appeared in OpsLens.